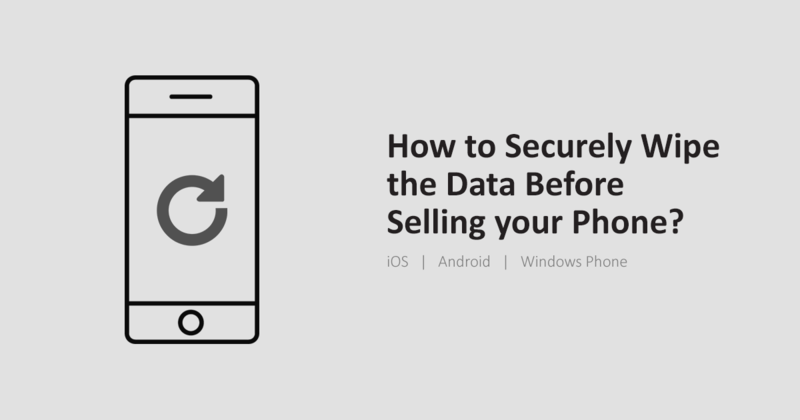 How to Securely Wipe the Data Before Selling your Phone? In this guide you will learn how to clear your personal data from mobile phone before trading or selling it to someone. Nowadays moving to the new device is really a habit of every mobile user. Whenever a new smartphone comes in a market, so many users want to get the device right away from its releasing. But the thing which should be taken care of that before selling or trading your device with the new one you need to wipe its data first because it can fall into the wrong hands. Our article is for three major tycoons of mobile operating systems. The thing which is highly notable here is that data can be recovered with the help of some professional tools. Only a physical harm to the device can completely wipe the data from the device, but some of the precautionary measures can be taken while giving the device in the market. Make sure that you have already created a backup of your data including your contacts. Do not forget to remove your SD card and sim card from the device. Do not forget to log out from the accounts of social media and then clear the data of those apps as well. Before removing an SD card perform a separate format on it. If your device is running on 5.0 lollipop or later version then your device is having Android device protection or FRP (factory reset protection). With the help of this feature, you can make the phone unusable for the new owner because your phone will require your GMAIL account and password in order to start. So first you need to deactivate FRP system on your phone if you are planning to sell it in a market. First of all, you need to remove security locks from your phone. Go to settings then lock screen setting then screen lock and then remove it by choosing the None option. Now remove running accounts from your device like Google account. Go to settings then user and accounts then tap on your account and choose the remove option to wipe it from your device. You’ll be asked to enter your passcode if you haven’t removed your passcode from the device yet and then tap on Erase everything. Once the process is done, select the option to reboot your phone. Note: if you have a Samsung device, please remove your Samsung account as well from the device. The security features which Apple provides are better than Android. There are fewer chances of recovering the already wiped data in an iOS running system. If you perform the task of wiping your data through the method below, there are fewer chances of recovering it. Before going any further, Unpair your Apple watch, turn off Find my iPhone. Now Sign out from the other service of iOS like iMessage and the app store. Go to setting then Messages then turn off the iMessage option. Sign out from Apple ID, go to setting then iTunes & App store then tap on your id and then tap on a sign-out. Remove your social media accounts from the device such as Facebook, Whatsapp, Twitter and etc. Now go to settings to sign out from iCloud, tap on iCloud and scroll down the page to the bottom and then tap on Sign out. Note: Do not delete the iCloud data manually because it will delete the data from the iCloud store as well and you will be no longer having back up of your data. Time to wipe the data. Go to settings then General then Reset and choose the option Erase All content and settings. Confirm the selected option. The best feature for securing your data is provided by windows phone because once you are done with wiping your data, you can load the dummy data to overwrite the traces of your original data. The best and easy way to wipe data in windows phone is to perform a factory reset task and then load dummy data. Go to settings App, scroll down and tap on About and then tap on Reset your phone. Tap on confirm the action and then wait while the phone is performing the factory reset. Now, before giving the phone in a market, connect your phone to your Pc. Open the phone window, and then load the dummy data into it. Do not load your personal photos into it. Store some audio and video songs into it. Try to fill the data as much as you can. Again perform the factory reset task on the phone using the above-mentioned step. Make sure all your original data is overwritten. Open a Microsoft site, log in using your account and remove the device which you have just wiped.